For the unrelated 1995 PC game, see Druid: Daemons of the Mind. Druid is a computer game for the Atari 8-bit family and Commodore 64. It was also ported to the Amstrad CPC and ZX Spectrum. 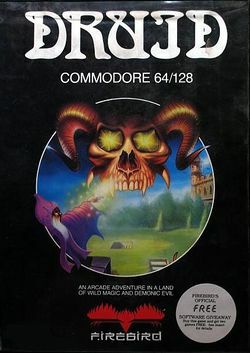 Druid was originally published by Firebird Software in 1986. The game was designed by Andrew E. Bailey, along with Dene Carter who was responsible for much of the graphics, and the music was composed by David M. Hanlon. The game was ported by Nippon Dexter to the Japanese MSX2 in 1988. Another port of Druid entitled Druid: Kyōfu no Tobira (ドルイド　恐怖の扉, Druid: Kyōfu no Tobira? lit. Druid: Gate of Terror) was made for the Famicom Disk System by Jaleco in 1988. "As Last of the Great Druids, wander through the Dungeons of Acamantor with your mighty Golem by your side on a quest to destroy the four demon princes." Druid is a fantasy-themed arcade adventure, where the player plays the part of Hasrinaxx, a druid who is trying to rid the world of the evil Acamantor and his army of demons. To do this, Hasrinaxx must travel through several levels. The first level is a normal landscape, and the ones after that are underground, each one deeper than the previous. Each level is infested with various enemies such as ghosts, giant insects, and even demons. Hasrinaxx can shoot these enemies with three different weapons: water, fire, and electricity, but they all come in a finite supply and are not equally effective on all enemies. Hasrinaxx can also summon a Golem to help him, or turn invisible for a brief period. Atari tape box, rear, with instructions for other consoles. This page was last edited on 27 January 2017, at 16:48. This page has been accessed 8,425 times.